The collection of the National Museum of Health and Medicine (NMHM) contains several objects relating to Presidential health and care. In regards to the Lincoln assassination, the museum contains items extracted from both the President and his assassin during their subsequent autopsies. Booth’s vertebrae and a piece of his spinal cord, through which Boston Corbett’s bullet passed, are housed in this collection. From Lincoln’s autopsy, the museum has pieces of Lincoln’s skull, the bullet that took his life, and some hair clippings taken by the doctors and surgeons as mementoes. As was previously written, the collection was once housed at Ford’s Theatre from 1865 – 1887 when it was called the Army Medical Museum. During that time at Ford’s however, the Lincoln relics were not part of the collection, only Booth’s pieces were there. In fact, the bullet that killed Lincoln was entered as an official exhibit during the Conspiracy Trial and it, along with the skull pieces, were housed with the other evidence in the office of the Judge Advocate General. In 1940, the exhibits were donated to the Lincoln Museum (Ford’s) who then gave the bullet and pieces of Lincoln to the Medical Museum. So while pieces of Lincoln and Booth both returned to the venue of their last living meeting, it was not at the same time. This probe has a specific name and a specific function. Called a Nélaton probe (or Nélaton’s probe) it was used by the doctors during Lincoln’s final night to ascertain the depth and path of the bullet in Lincoln’s head. Before delving into that, however, let’s look at the history behind this medical tool. In 1862, Italian general Giuseppe Garibaldi, was shot while trying to take control over the city of Rome. At that time, Italy had just completed a massive unification to create one kingdom. This kingdom of Italy later became the republic of Italy as we know it now. However, as of 1862, several cities in Italy did not accept unification and Rome was one of them. Tired of waiting for them to come around, General Garibaldi decided to raise a volunteer force to take the city of Rome. The Battle of Aspromonte, as it was called was fought between Garibaldi’s men and the Royal Army of Italy on August 29th, 1862. Both sides were hesitant to harm the other as they were countrymen and Garibaldi was well liked and supported by the people of Italy. When the Royal Army “attacked” Garibaldi’s forces, he ordered his forces not to fire on their brothers. One part of his army did attack though, and during the fire fight, Garibaldi was hit three times. The battle lasted less than ten minutes with only 15 combined casualties. Garibaldi and the rest of his volunteers were arrested and imprisoned. While imprisoned, Garbaldi was still given the respect and medical treatment he deserved. Two of the three shots Garibaldi received were to the hip and proved easily treatable. The third shot hit Garibaldi’s right ankle, just a little above and in front of what we would consider the “ankle bone” (scientifically, it was his internal malleolus). This wound pained him greatly. When he was on the battlefield, a surgeon had made an incision on the opposite side of the wound when he felt swelling but found nothing inside of it. A few days after the battle, Garibaldi was re-examined by more than half a dozen doctors who all believed, save one, that the bullet was no longer in his ankle. Meanwhile, in England, supporters of Garibaldi in the medical field took it upon themselves to see if they could help the general. In an extremely presumptuous way, the English doctors elected that Dr. Richard Partridge, professor at King’s college, should travel to England and check on Garibaldi’s wound and treatment. When Dr. Partridge arrived on September 16th, he examined Garibaldi himself, and came to the same conclusion of the Italian physicians: the ball was no longer in his ankle. He returned back to England and guaranteed his colleagues and the press that, while Garibaldi was still in considerable pain, it was not caused by a bullet being lodged in his ankle. Dr. Partridge believed his condition would improve in time. After five weeks, though, no improvement was noted and Garibaldi was still in quite a deal of pain. This time, the Italian doctors reached out. They sent for Auguste Nélaton, a Parisian professor of surgery. He arrived on October 28th and examined Garibaldi himself. After inserting a normal probe into the wound, he was convinced that the bullet was still in there. The Italian doctors did not concur, citing Dr. Partridge’s agreement of their initial assessment. So, Dr. Partridge returned. Soon, Garibaldi’s sick room became an international conference with the Italian doctors, the Frenchman Nélaton, the Englishman Partridge, and even a Russian physician all prodding and poking General Garibaldi. Dr. Partridge actually changed his mind and started believing that the bullet was still in the general’s ankle. Nélaton, believing amputation to be unnecessary, ordered that the wound entrance be widen with sponges so that the bullet could be removed in time. While the Italian doctors followed this idea, they were still unconvinced that there was a bullet in Garibaldi, and were getting sick of all these foreigners going back and forth on the matter. When Nélaton returned to France, he started working on a way to prove that there was a bullet in Garibaldi. The problem was that it was impossible for a physician of the time to identify the hard substance met by a probe in a wound. It could be normal bone or a foreign substance like a bullet. The bulk of the Italian doctors believed their probes continually hit the normal bone structure of the ankle, while Nélaton thought it was a bullet. Nélaton began constructing a new probe for his purposes. In the end, his probe was ingenious in its simplicity. At the tip of a normal medical probe he attached an unglazed porcelain tip. When the porcelain touched bone inside a wound, the probe would be unaffected. When it rubbed against the lead of a bullet however, the tip would become marked identifying it as a foreign substance. Nélaton quickly sent his new instrument to the doctors in Italy. 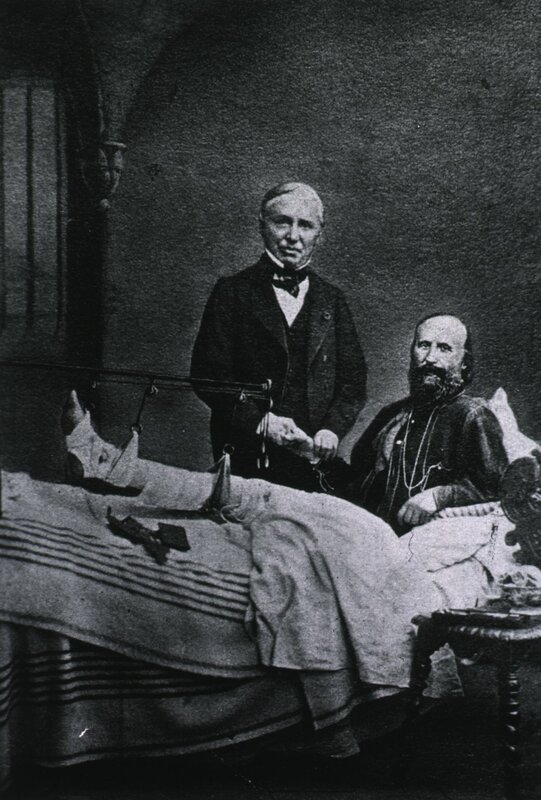 After using it to confirm Nélaton’s diagnosis that the bullet was, in fact, still in Garibaldi’s ankle, the Italian physicians were able to successfully remove it on November 22nd. Shortly thereafter General Garibaldi sent a letter to Auguste Nélaton offering his love, gratitude, and thanks. Nélaton’s probes proved wonderfully efficient. They started to be produced on mass and were shipped all over the world. They quickly became an instrument of necessity for any military surgeon and found a market in the surgeons fighting on both sides of the American Civil War. They continued to be used into the 1900’s before they were essentially replaced by the advent of less intrusive devices like the X-ray. “About 2 AM the Hospital Steward who had been sent for a Nelatons probe, arrived and an examination was made by the Surgeon General, who introduced it to a distance of about 2 ½ inches, when it came in contact with a foreign substance, which laid across the track of the ball. Using Nélaton’s probe, the doctors established that the bullet was above and behind Lincoln’s right eye. 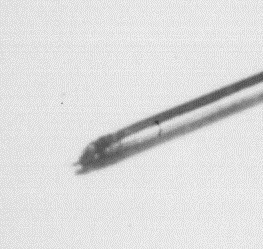 Between its use in the early hours of April 15th and today, the Nélaton probe used by the doctors on Lincoln has lost the porcelain tip that marked the bullet. 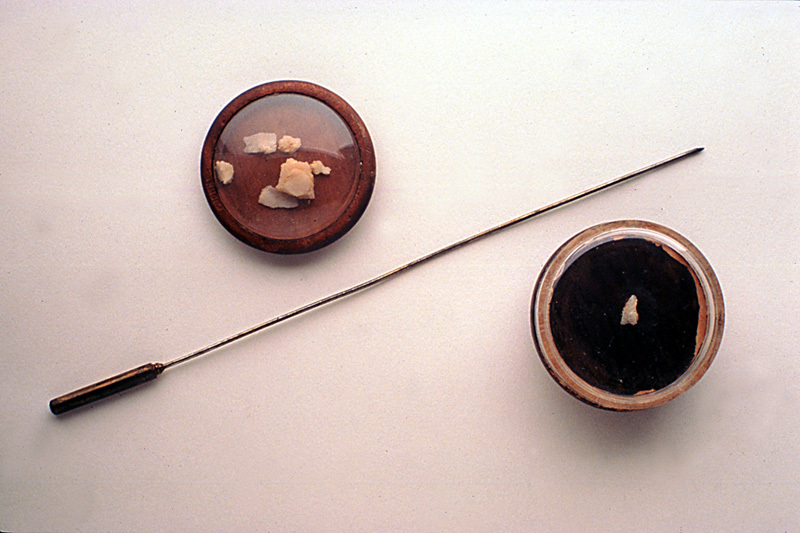 The end of the probe used by Lincoln’s deathbed physicans, missing the unglazed porcelain tip. While the first person to utilize Auguste Nélaton’s invention made a full recovery because of it, it was well established before the probe was introduced in Lincoln’s case that he was beyond help. The Nélaton probe did not change Lincoln’s medical prognosis as it did for Garibaldi, but it is still a historically relevant artifact. Its inclusion in the collection of the National Museum of Health and Medicine is so that it can be a testament to the devotion of the doctors who cared for President Lincoln. Despite the hopelessness of his situation, doctors like Barnes, Leale, Taft, and others, did all in their power to aid and comfort the fallen President. I’m sorry to report that the Booth vertebrae, probe, etc. are not on display at the National Museum of Health and Medicine at the present. I have written the director to see what the story is, but have received no reply. While you discovered the vertebrae weren’t being displayed, I would think that the pieces of Lincoln and the probe would still be something to keep out. The museum has an online exhibit of their Lincoln relics so I would think they would display them in house as well. Also Laurie, have you ever heard of a piece of Booth’s spinal cord being on display anywhere? A book from 1872 talks about it being in the Army Medical Museum. I wonder if they still have it and just hide it away. Or perhaps that’s what’s in the Mutter Museum. WONDERFUL post, Dave! A facinating article regarding Garibaldi. I’m not up much on the medical aspect of the 19th Century as much as I should be – I found this utterly facinating. That said, I, too thought that the artifacts of JWB’s thorax, et. al. were still on display. It’s odd that it’s not. I had also heard/read about the spinal cord. It could be at the Mutter Museum – we should check…. that is another place that I want to visit sometime…. The tissue that was probably cleaned off the cervical vertebrae is at the Mutter. It is probably not from the thorax. I once talked to the late museum director about what that facility has in its collection, and that is what I was told. You beat me to the punch on this one, Roger. Back in March I posted about the Mutter Museum tissue and cited how you figured out what it really is. The finger is pointing to Booth’s vertebrae, with the piece of his spinal cord on the bottom center. The jar in the background contains Einsenhower’s gallstones and the other bones come from President Garfield. Thanks for the clarification! I was wondering about this. I still plan to make a trip to the Mutter Museum sometime in the future…. when I made my post. I have tried to find former Mütter director Gretchen Worden’s “Is It the Body of John Wilkes Booth?” in the December 1994 edition of “Transactions & Studies of the College of Physicians of Philadelphia” online, but I’ve only seen it cited on other web pages, not the text of it. If you ever find the text could you please post the link? Many thanks. And kudos on the new layout – looks real good. I’ll look into seeing if I can get a copy of the article through my local library. If they can get it, I’ll put it up. Unfortunately I am without power at the moment as a storm similar to the recent one in Maryland hit the Chicago western ‘burbs a little after noon on Sunday. My whole city is without power still and they’re saying my area won’t be restored until late on the fourth. While the heat is making it miserable I’m more upset I can’t post on my blog! Also, I’m glad you like the new header image. I’ve been trying to create a new one every month. The background is a Brady picture of the box, the words come from the wanted posters, and the drawing is from an issue of Harper’s Weekly. Once I get power back I’ll look more into whether I can give you access to add pictures to your comments. I’m not sure if it’s possible though. Glad to know that you and yours are fine! Certainly hope that you get your power back on soon! We had two tornadoes touch down in Richmond/Hanover last week – the last one on Saturday evening only 8-10 miles from my house. It was pretty scary. We are fortunate, we have power – but over 80,000 in VA do not. Things here are a mess from the storm. Please try and stay cool – I pray they fix things soon! I too, LOVE your new masthead! It’s so professional looking – you are doing a GREAT job! I am studing The assisation of President Lincoln, for some reason I find his hole life fascinating and have been through quite a few bok about him and the assination thanks for the info keep up the good work on this effert appreciated greatly. Thanks for reading Dan. I’m glad this site is helpful to you.